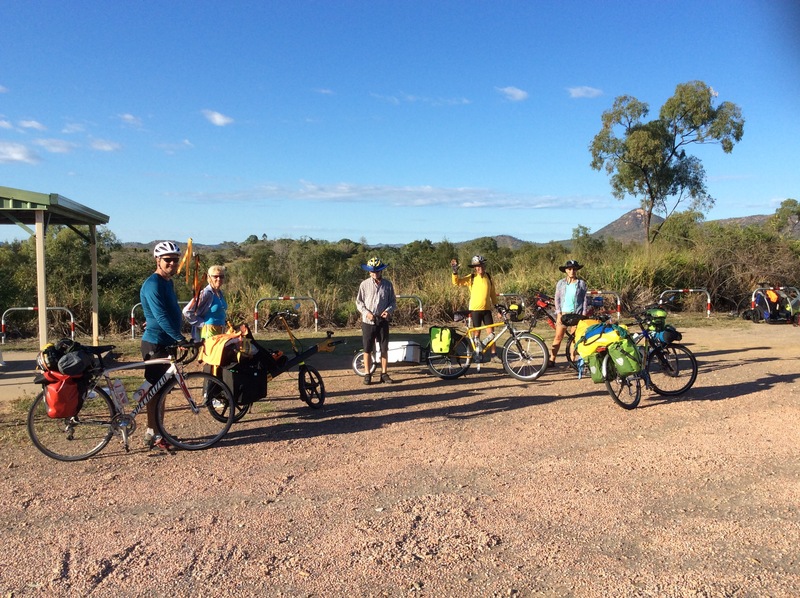 There were eight of us who actually left The Bicycle Pedlar in Townsville at the same time. One got the time wrong and chased us all the way to Woodstock, the other two left earlier with the aim of completing the most epic bike journey of their whole lives so far (and I bet as I write this they are feeling every epic part of the journey!). The Flinders Highway out to the Reid River rest stop had wonderful things like long road trains and a reasonable headwind. My cycle touring practise prior to this trip had consisted of riding a few kms to work or the shops, so I wasn’t as quite prepared as I would have liked for the extra weight I was carrying as well as the extra kilometres. Now The ‘weight’ word has slipped in, I better ‘fess up. My fully loaded bike, complete with 6.5 litres of water and a bit of food, weighed in at a hefty 42kg. My bike handled all this weight very smoothly, but the further I rode, the more I tried to think of which items I could send home with Mick after the first night! As hard as I tried, the answer was none, except for a sarong which didn’t even weigh that much. We will see what happens at the end of the trip! Everyone fought for the tiny bit of grass available to put our tents on once we got to Reid River (it’s very dry there) and the rest of the evening was full of much laughter, eating and drinking. 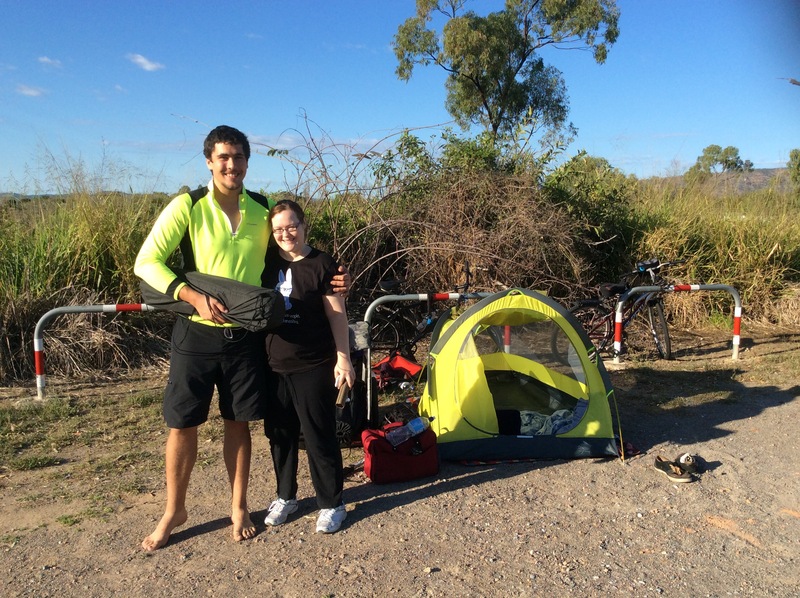 And of course, the arrival of Sam and Alysha who had just set a personal record for kilometres ridden in a day! The water at Reid River is not drinkable, although we did use it for cooking. The toilets were useable, although one of the women’s didn’t flush very well and the other had a huuuge spider (apparently, I didn’t look!). Nearly everyone was packed up and ready to go before 8am this morning after a reasonable night’s sleep. After the goodbyes, the rest of the party set off for Townsville, and I set off on my big adventure! There were a few doubts running around my mind, like ‘do I even want to do this!’, however I know from experience that once you get in the swing of things the journey becomes fun (it does! It does!). 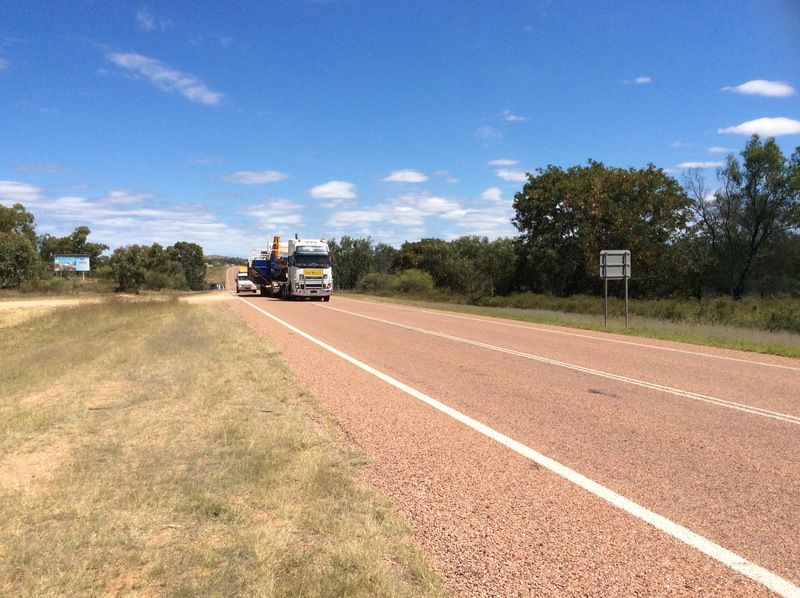 The highway to Charters Towers has got a pretty good shoulder with lovely little red reflectors embedded in the road every metre that like to get in the cyclist’s way, particularly when cars are going past. I was really grateful to have a handlebar mirror because I could ride out in the lane, where it was often smoother, and then pull back over the white line when I saw a car or truck came past. The road has lots of undulations too, and I got up to the record speed of 44kms/hr a few times (going downhill of course). The accompanying uphill meant I sometimes slowed down to 11kms/hr. It’s still not hilly though, with the Mingela Range the only long, slow climb. Mingela Pub was closed when I got there 30 kms after Reid River. 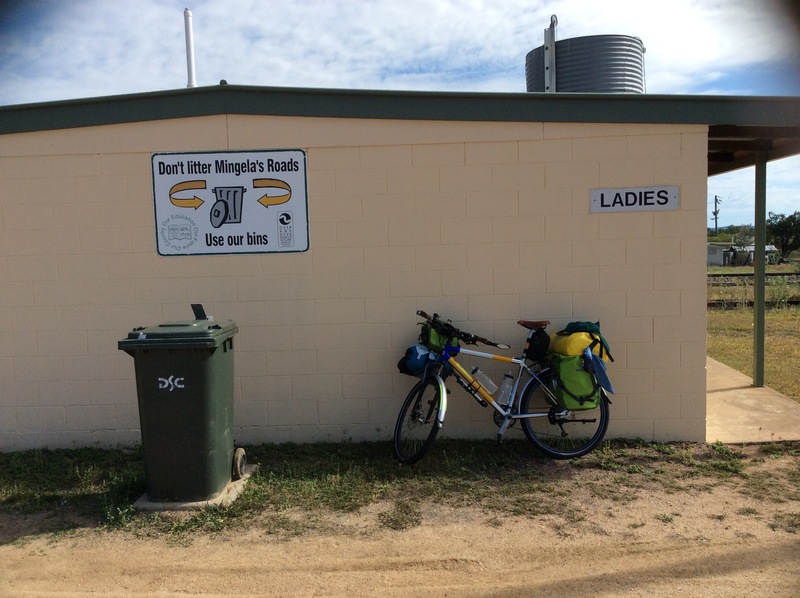 I was picturing a coffee, but had to settle for an apple and a visit to the public toilets.At about the 55kms mark, I pulled into Macrossan Park free camp area for lunch. If I had known there is a roadhouse/store just a kilometre or so further on, I probably would have waited until there to stop. 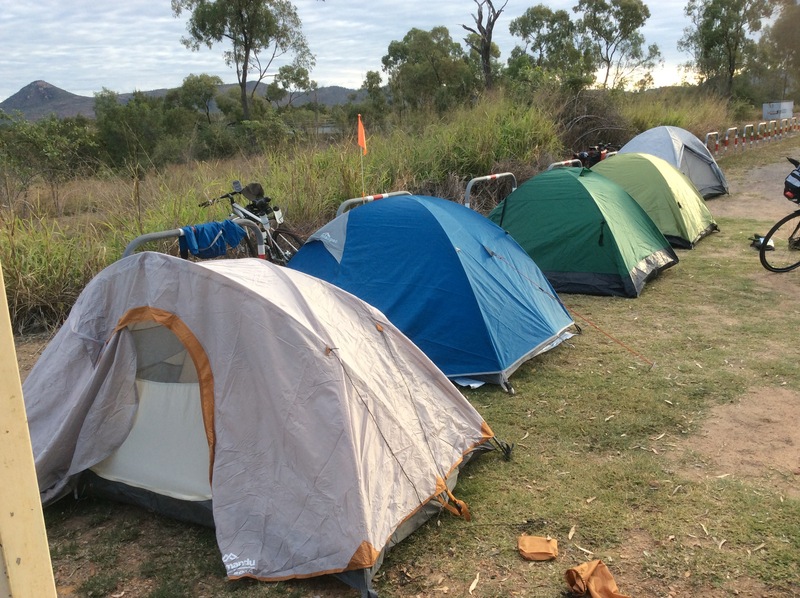 Macrossan Park is fairly shadeless and dry and dusty, but it must have some redeeming features because there were campers set up. It has toilets and bbqs. …and the traffic picked up as it inevitably seems to do when you get closer to a town. 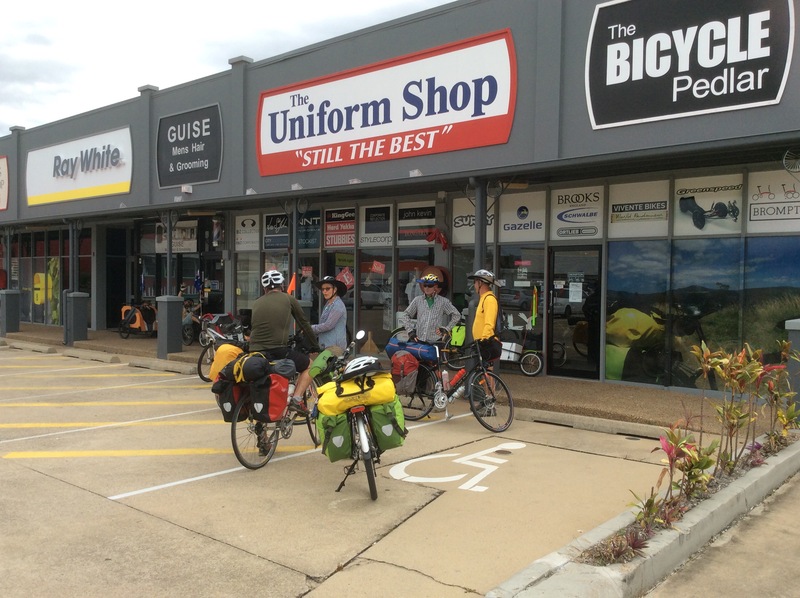 The info centre advised me that the Big4 was the most expensive caravan park, but there was another heading out of town to Greenvale, which is the direction I am taking tomorrow. Luckily I chose the cheaper option of Dalrymple Caravan Park because it still cost $26 (no, it’s not a typo) just for my little tent and me. There are probably free camps further out of town, but I really wanted a shower and clean clothes. I will have to work on this! The Foodworks supermarket was the only supermarket open on a Sunday, so I rode the couple of kilometres back into town to get some veggies for dinner and snacks for tomorrow. I most probably purchased too much (I can just see Mick shaking his head), but I have a slight paranoia about going hungry and not being able to get more food. Tomorrow’s ride will be about 113km with no water or food available until the end. If there are ‘undulations’, headwinds, heat, I could take a long time to get there and just want to make sure. I’ll get good at this solo touring and wild camping eventually! 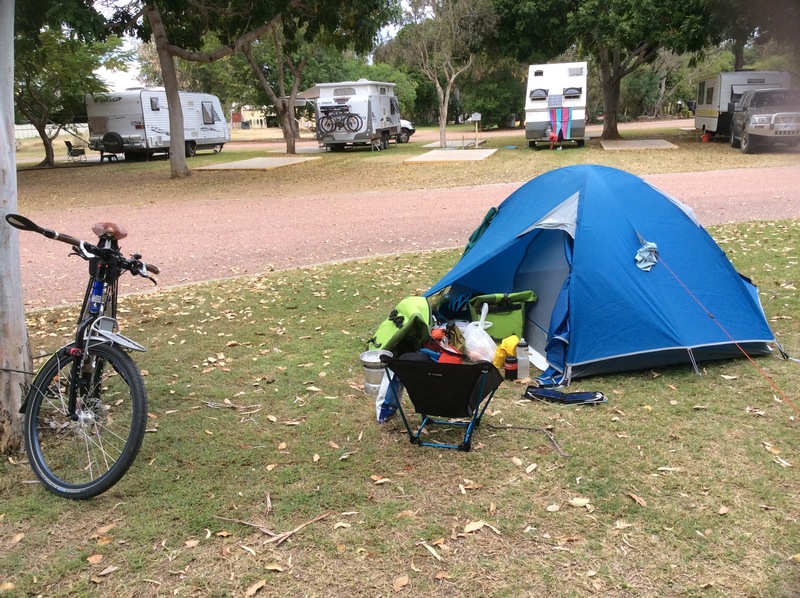 Campsite at Dalrymple Caravan Park. Nice, but pricey. This evening I will enjoy sitting in my comfy Helinox chair that I have lugged all this way, cooking in my Trangia and going to bed early ready for a new day (and a coffe made with the Airspresso…will it go well?). ← Solo woman cycle tour begins! Or you could have cycled a bit past dalrymple park and camped on the cemetery! 🙂 lots of grass patches not to close to the graves (you wouldn’t want to disturb them!) And the toilets don’t get locked at night so you’ve got a sink to wash yourself and that all for free!! Haha, I saw your cemetery. It looked quite inviting! I did really enjoy my shower and clean clothes…I think I need to spend some time touring with you!